This is where our shrimp comes from. The water part. Under that boat that is trawling shrimp. “There comes the ‘Miss Susan’! Do you think they have any extra shrimp today?” I asked my husband. He knows. Such a patient guy - he put his jacket on and went to buy twenty pounds of sidestripe shrimp. There was just enough for him and another man who came rushing down the dock, thinking that he beat everyone to the "Miss Susan". Living on a boat can have it’s advantages. Like shrimp so fresh that they were caught an hour ago. The “Miss Susan” takes orders in advance and they are often sold out when they get to the dock. They use a beam trawl and fish near Wrangell. Shrimp season isn’t open all year around, so we put some up in the freezer. The following is how I take care of the shrimp that we buy, plus a quickie way to cook some up. Shrimp can spoil quickly, so they need to be kept cold and taken care of right away. I freeze or cook shrimp the same day that I buy it. Halibut inspecting a cooler of shrimp. More about Halibut HERE. Sidestripe shrimp (Pandalopsis dispar) with a quarter to show size. The top shrimp is eggy and the bottom shrimp is not. I buy 'mediums', so sidestripes can be bigger than this. 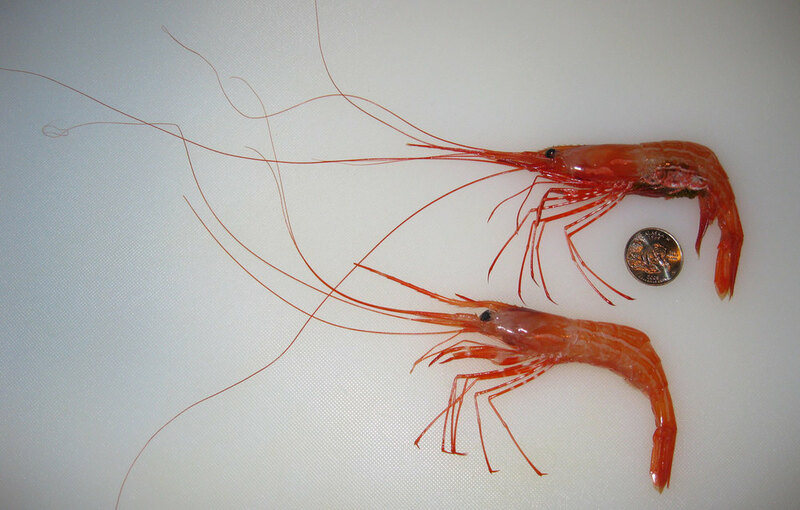 Sidestripes are a mid-sized shrimp for Alaska. The spot prawn is much bigger and several other species are smaller. Sidestripe shrimp have antennae that are longer than their bodies. Their striped legs are pretty stylin', no? The carapace is the hard covering over the front half of the shrimp. Out of the top front of the carapace is the rostrum. A unicorn horn with barbs. This little sucker is armed. I know that some people cook and eat the whole shrimp. That's not a part of the culture that I grew up in. We eat the tail meats and the eggs (and some people don't eat the eggs), so the first thing that I do is 'pop heads.' Most people simply twist or pull the heads off and discard them. I also pull the vein while beheading the shrimp. You don't have to devein this type of shrimp if you don't want to, and most people here don't. 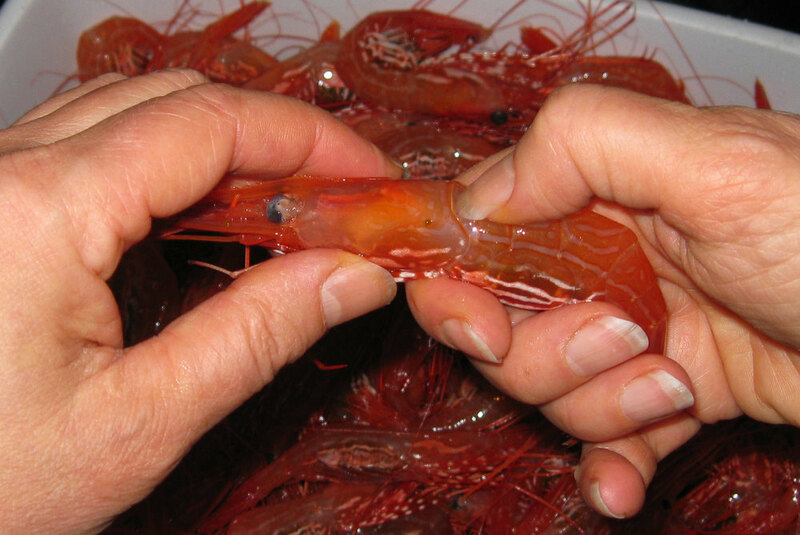 If you are not familiar with deveining shrimp, it is cutting into the peeled tail meat and removing the vein. Even though it is safe to eat cooked sidestripe shrimp meat with the vein in, I pull the vein while popping heads. Place your thumbnail or the tip of your thumb behind the carapace. Mind the barbs on the rostrom. Owie! Pull on the carapace and you will see the vein pulling out of the tail. Did I mention that there are sharp spots on the shrimp? I haven't tried wearing gloves for this, but you might. With your fingertips, not fingernails, gently and smoothly pull the vein out of the tail. I fill quart freezer bags with the uncooked tails and mark them with the date. Shrimp will last in the freezer for up to two months. If you think that you are going to hold them longer than that then you need to glaze them a day or so after freezing them. To glaze shrimp turn the freezer down as cold as it will go and freeze the shrimp tails solid. Get some water as cold as you can get it without freezing it. Pull a bag of shrimp out of the freezer, open it, pour the cold water into it, then pour the water out of the bag right away, close the bag of shrimp and quickly refreeze it. 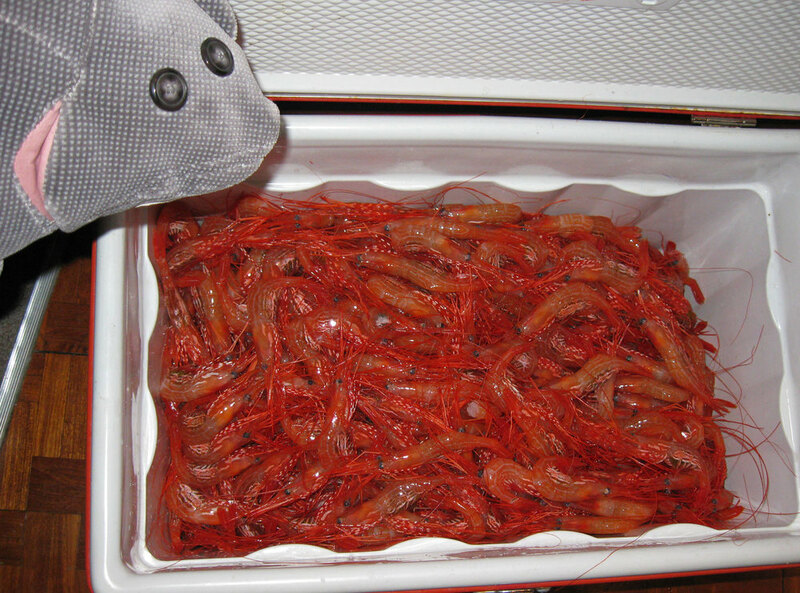 That little coating of ice on the shrimp should help protect them from freezer burn for an extra month or two. A glazing solution with one tablespoon salt and two tablespoons sugar per gallon of water is said to improve the flavor of the shrimp. Bags of sidestripe shrimp tails ready to go into the freezer. That twenty pounds of shrimp that my husband bought yielded six bags for the freezer plus a generous shrimp feed for the two of us....with some leftovers. Cooking shrimp? You know I am a very simple cook. Explore some of those great foodie recipes online! Coconut shrimp, BBQ shrimp, shrimp fettuccine, shrimp cocktail....these sweet little gems are perfect for special recipes. I'm not going there, though. Okay, I will share how I cook the first shrimp of the season when my sweetie and I want speed and volume. Bring a big pot of water to a hard boil. Put in several handfuls of shrimp tails so that they will come back to a boil quickly. When the shrimp float, time them for one minute, then dip them out. Peel the shells off of the shrimp, dip in melted butter, eat. You might not even make it to the dinner table first. And yes, I scoop the little eggs out and eat them. They are very rich. Try them! Shrimp that have been frozen peel easier, so I often saute those in garlic butter. Thaw and peel one quart bag of shrimp. Dice or grate one garlic clove. Saute the garlic in a tablespoon of butter for 1 to 2 minutes, then add 1 more tablespoon of butter and the shrimp to the pan, saute the shrimp for one minute, turn, cook one more minute. The shrimp meats should have turned from translucent to opaque. IF you are able to keep a few for leftovers then chop them up and put them into scrambled eggs the next morning. Yum. I have to go call Linnea now, and order another twenty pounds of shrimp. May each and every one of you enjoy fresh Alaskan seafood sometime or many times in your life! Just a little note: I have no connection to the 'Miss Susan' other than as a customer. A happy customer.